While Francoeur suggested that Sal epitomized the mysterious “class of people who wish to go to jail,” the reality was that Sal, like her fellow jailbirds, was an alcoholic whose main offense was violating the city’s preposterously broad anti-vagrancy law. And Doughnut Sal was an even more intriguing figure than Francoeur might have imagined. By 1902, she had made a name up and down Northern California, amassed and lost a small fortune, faked her own death, and likely had the distinction of being the first woman to run afoul of California’s inaugural anti-prostitution law. Unrelated, but too good not to share: This ad posted in 1916 by Francoeur shows that freelancers have been paid in publicity for at least a century. Now as then, it’s tempting to see Sal as a character, an old-timer with a funny nickname and a gritty biography. Yet I’m hesitant to do so, partly because there’s no record of her personality—whether she was sassy, salty, or sour. (Perhaps to her credit, Doughnut Sal did not appear to have spoken with Francoeur, at least not at length.) And from what hints do remain of Sal’s life, especially her final years in San Francisco, it doesn’t sound like it was a fun one. Desperation and squalor shouldn’t be confused with eccentricity or color. Still, the tale of Doughnut Sal is a fascinating dose of anti-nostalgia, a reminder that being down and out San Francisco has always sucked. So grab your vegan organic doughnuts and a single-origin pour-overs and let’s get started. Before she was Doughnut Sal she was Sarah J. Folsom. She was born in 1833 into an old New Hampshire family that could trace its roots to “an ancient one in England.” In 1853, she emigrated from New Hampshire to Northern California. Her younger brother, George Washington Folsom, arrived the same year. According to family lore, he made it only after surviving a shipwreck and hiking across the Isthmus of Panama. There’s no word on whether Sal accompanied him on this trek. Her father and older sister also relocated to California, but she became estranged from her family, for reasons that will be obvious. One of her great-grandnieces told me that she only learned of Sal’s existence last year; she was never acknowledged or discussed by the family. What may be the first mention of Sal in Northern California newspapers was in June 1855, when the Sacramento police, in the words of the Daily Union, “made a descent on the houses of ill-fame throughout the city.” A woman identified as Sarah Jane Folsom was arrested along with dozens of other suspected prostitutes, including “forty-eight China women.” She was quickly found guilty of violating the state’s recently enacted anti-brothel law and fined $127. Though it went unremarked at the time, this earned Folsom the distinction of being the first woman charged under the new law. For the next few decades, Folsom lived a somewhat peripatetic existence, perhaps trying to keep ahead of the law, the taxman, and creditors. The 1860 Census found her in Marysville, living with a 36-year-old male cook. She reported owning $3,000 worth of real estate and $200 of personal property. In 1866, she was cited for unpaid taxes. Two years later, she was arrested again in Sacramento, this time for “enticing people into a house of ill-fame.” She failed to appear in court and forfeited her $10 bail. Murder in Monterey County.— Sarah Folsom, sometimes called “Doughnut Sal,” a woman of bad repute, who lived near Natividad, Monterey county, is missing and it is supposed she has been murdered. A horse tied near her house was found starved to death and a dress belonging to her was found in her house stained with blood with holes that appeared to have been made with a knife. A longer story on the “dreadful mystery” from the Salinas Standard reported that Sal had “been in the habit of visiting from time to time the neighboring towns for the purpose of prostitution.” A man who had accompanied her on these trips was also missing. The authorities appealed to the public for clues. Doughnut Sallie was the belle of the occasion. Her dress was of striped calico, which was imported expressly for her by Koenigshofer at a cost of a bit a yard, with rabbit-skin flounces and overskirt of bedticking. Her feet were encased in army brogans, gracefully adorned with bows of red flannel. Hair, au naturel. [...] Her shoulders were covered by a magnificent opera-cloak, made of red blanket and trimmed with a fringe of caterpillars. By the mid-1880s, Sal had returned to Sacramento, getting charged with “enticing” and “exhibiting.” (The word “prostitution” is never seen in these old accounts.) 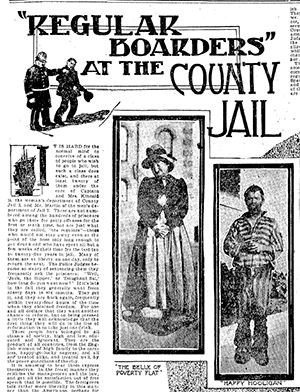 In March 1894, she was found guilty of vagrancy, even though she proved to the court that she had $900 in a San Francisco bank. She was set free only after she agreed to leave town. 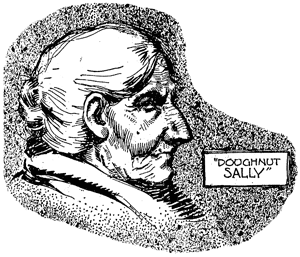 “so penurious that she haunted the saloons on the Barbary Coast and begged money” despite being worth a rumored $30,000.‘Doughnut Sal’s wooers”—a jokey reference to her reputed profession, alleged wealth, or both. The Call reported that “she was so penurious that she haunted the saloons on the Barbary Coast and begged money from the frequenters” despite being worth a rumored $30,000. (That would be more than $800,000 today.) When she was arrested for vagrancy in October 1899, she managed to sneak $20 into the city jail. The original source of Sal’s wealth is not clear, but she clearly had significant means at one time. In a 1876 suit filed in San Francisco, she alleged that she’d lost $4,000 when she made a deposit in the Adams Bank in three days before it failed in 1855. She belatedly sued the bank’s directors for fraudulently taking her money. According to one article, she recovered $12,000; another says a jury found in favor of the bank. Despite her apparent stash of assets, Sal was repeatedly charged as a vagrant. In January 1900, Acting Police Chief W. J. Biggy ordered his officers to “make a daily note of all known or suspected vagrants,” paying “particular attention to all known or suspected frequenters of houses of ill-fame and hangers-on about saloons of questionable character.” Under the city’s catch-all anti-vagrancy code, charges could be brought not just against the homeless, but the unemployed, beggars, loiterers, midnight wanderers, and “every common prostitute and common drunkard.” The maximum punishment was six months in jail. The law was applied broadly and often: “Jack the Ripper,” an otherwise “inoffensive” young man prone to getting violently drunk, was reportedly sentenced 115 times in just seven years. “What do you think you are?” inquired the court. 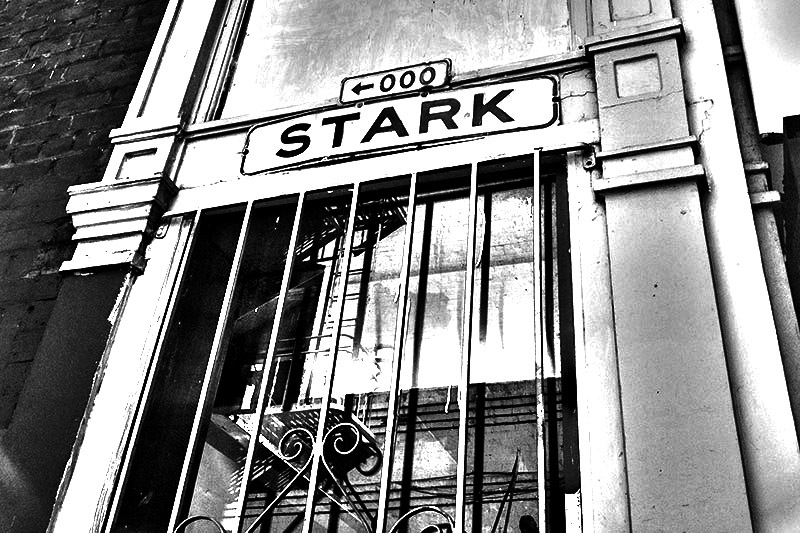 Stark Street, formerly called Polk Alley, was one of the many San Francisco side streets that only made it into the news as backdrops for drunkenness, destitution, and violence. Among the various mentions of Stark/Polk around the time that Sal lived there: A tourist “crazy drunk” from “strong potations of Barbary Coast whisky” jumped through a window and ran off “yelling like a Sioux Indian”; a young man “succumbed to the wiles of an aged and demoralized member of Circe’s wicked legions” only to be attacked by her husband; a man died after drinking sulphuric acid, purportedly “mistaking it for wine”; a police raid on the residence of two suspected burglars revealed “a quantity of plunder stolen from barber shops”; an African-American woman set fire to a room in a two-story tenement “in a spirit of drunken revenge”;Another booze-fueled tragedy on Stark Street, and evidence that keyword-based ad placement has always been terrible. an elderly alcoholic known as “Old Moses” was severely burned when he attempted to light a fire on the floor of his room; a Brazilian tamale vendor died penniless and alone; a “miser” found dead in his “wretched room” was discovered to have had $5,000 in the bank. 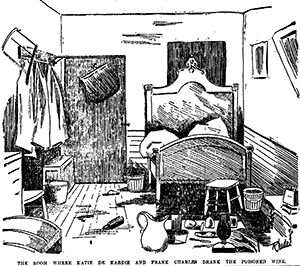 In its coverage of a young alley resident poisoned by her lover, the Chronicle described the cul de sac as “just such a place as Victor Hugo would select for the scene of one of his mysteries.” One side was taken up by a “dilapidated” two-story building of single-room apartments that “present much the appearance of cells.” In 1902, child-welfare officials found a couple and three children living in “abject poverty” in a “room eight feet square” on the alley. 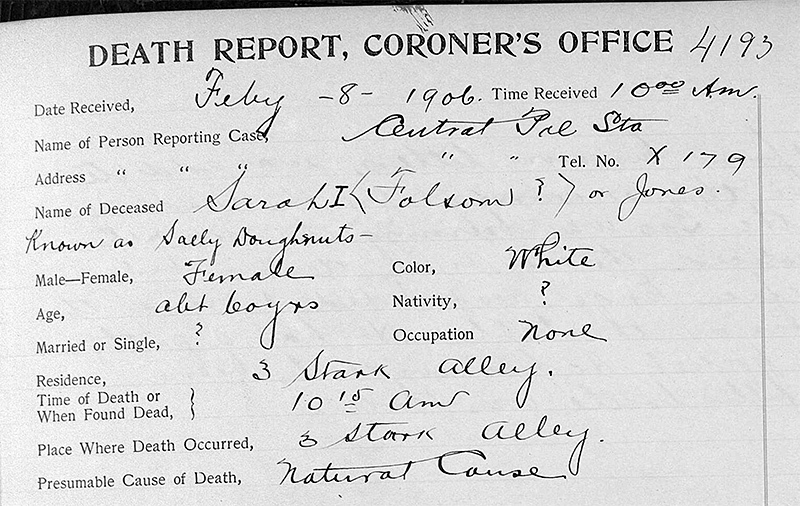 The 1900 Census records for Stark Alley show that many residents were immigrants. Most of the men were laborers; many of the women were washerwomen or, like Sal, gave no occupation. The building that now stands where Doughnut Sal used to live is currently valued at $3.7 million. Two dollars were found in her clothing, along with a ring and a pair of earrings. The public administrator found a bank book in her clothes; the Chronicle reported that it recorded $200 in savings, “the remains of her one-time prosperity.” It seems to have been enough for a decent burial. The now unmarked grave of Sarah J. Folsom, AKA Doughnut Sal, is in a shady corner of Greenlawn Memorial Park in Colma. There are four doughnut shops within a five-minute drive. Thanks to Marylin Cutting and Lori Scherr for their assistance.